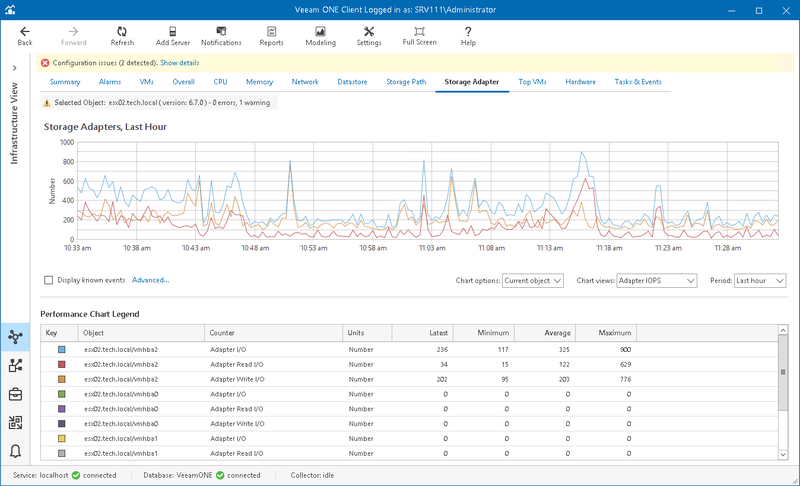 The Storage Adapter chart displays historical statistics for the storage adapters on the selected host. The following table provides information on predefined views and counters. Average number of commands issued per second on a storage path during the collection interval. Average number of read commands issued per second on a storage path during the collection interval. Average number of write commands issued per second on a storage path during the collection interval. Rate at which data is read on a storage path. Rate at which data is written on a storage path. Average amount of time that a read operation on a storage path takes. Average amount of time that a write operation on a storage path takes.